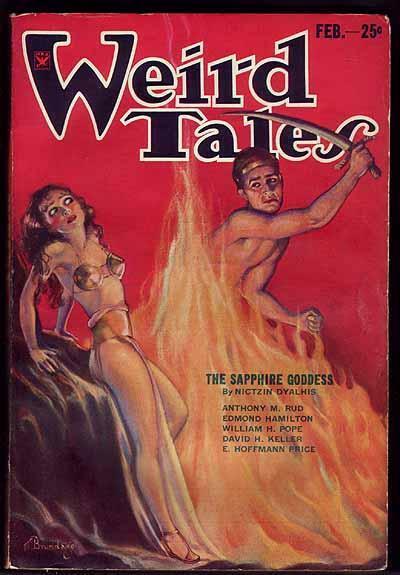 PULP COVER FRIDAY GOES WEIRDER! 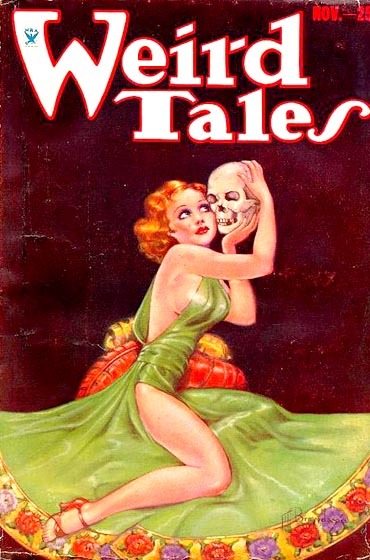 Or, WEIRD TALES, part two. Last week we looked at some covers from 1920’s issues of “The Unique Magazine,” as it proudly called itself. 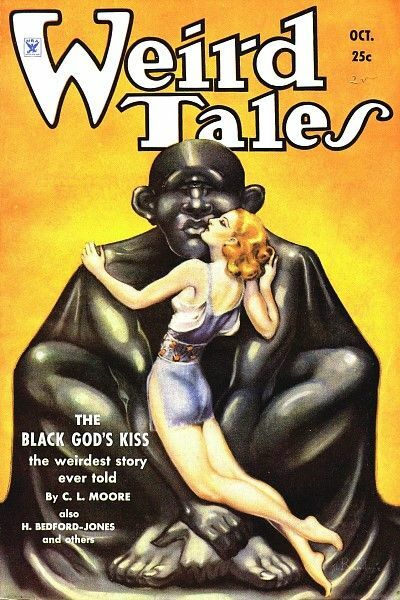 This week we tackle the ‘30s, or, as I think of it, WEIRD TALES golden age. I call it that for a number of reasons. First, issues published. 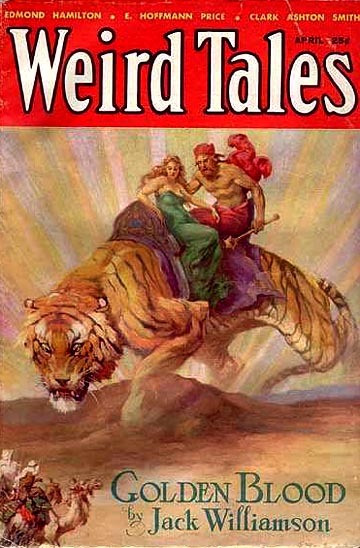 WT was mostly a monthly during the 1920’s, but remember that it started publication in late 1923. Its first decade saw 75 issues. 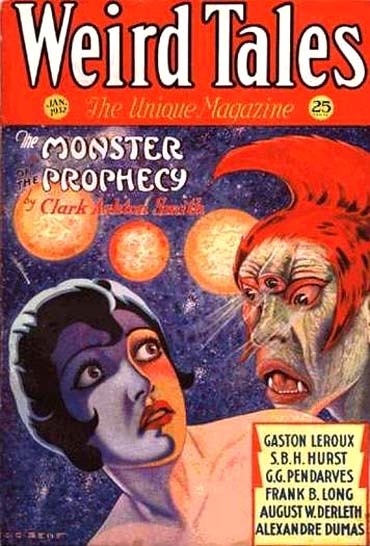 It remained a monthly basically throughout the ‘30s, missing an issue here and there, for a total of 115 published. By the 1940s it was strictly bi-monthly, with 60 issues in the decade. The same with the 1950s, during which it produced 27 issues before ceasing publication before the end of 1954. H.P. Lovecraft (1923): 31 – 37 – 4. Robert E. Howard (1925): 13 – 41 – 0. 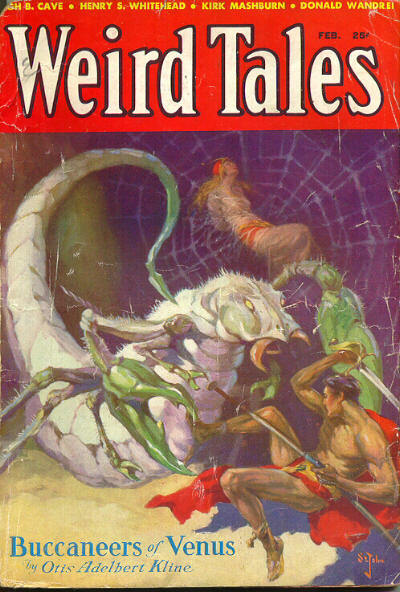 Clark Ashton Smith(1928): 1 – 55 – 4. C.L. Moore (1933): 0 – 16 – 0. Seabury Quinn (1923): 37 – 63 – 41. 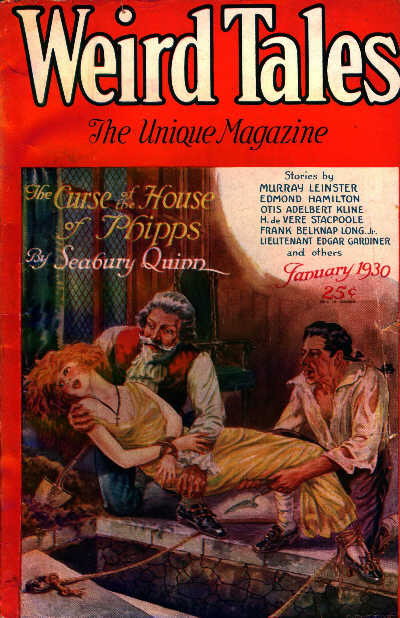 Some notes: The Oct. 1923 issue saw the first fiction published in WT by both HPL (“Dagon”) and Quinn (“The Phantom Farmhouse”). 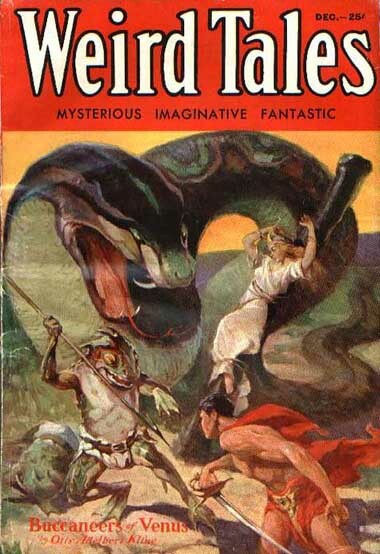 The 1930’s REH stories include all his Conan stories. 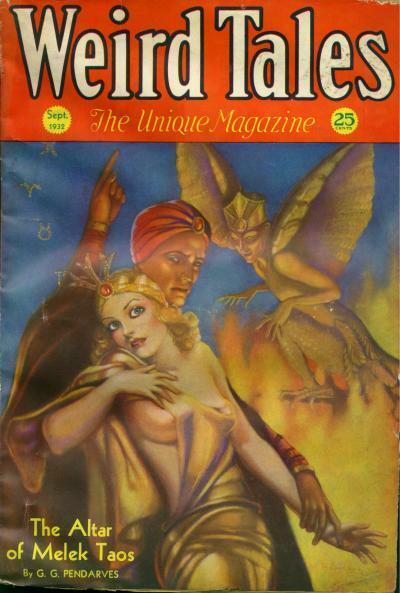 Quinn also had 7 stories published in WT in the 1950s. Of the five writers it can fairly be said that HPL did his best work in the 1920s if you’re counting quality first. Finally, these numbers may be a little bit off since I just did a quick run through the THE COLLECTOR’S INDEX TO WEIRD TALES (Jaffery and Cook), but I think on the whole they illustrate my point. Finally we come to the cover art. Not always the zine’s strength, this changed totally when Margaret Brundage came on board in 1932. Various sources quote various numbers which I can’t get to agree, but let’s say that she did about 60 covers for the magazine in the 1930’s and an additional 8 or so in the 1940s (ending her association with the magazine in 1945). She was their finest and most prolific cover artist and did 39 straight covers (June 1933 to August 1936). 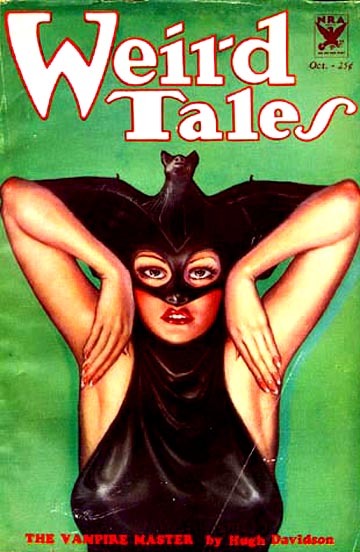 I’ve resisted the temptation to simply copy about fifteen of her covers for this post. I know I’ve used some of her covers before so I’ve tried to use different ones this time around. First of the decade. 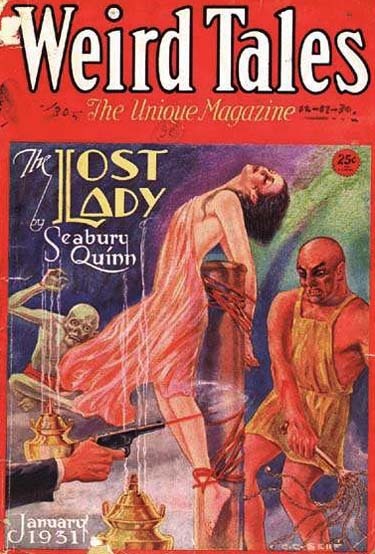 Seabury Quinn story. 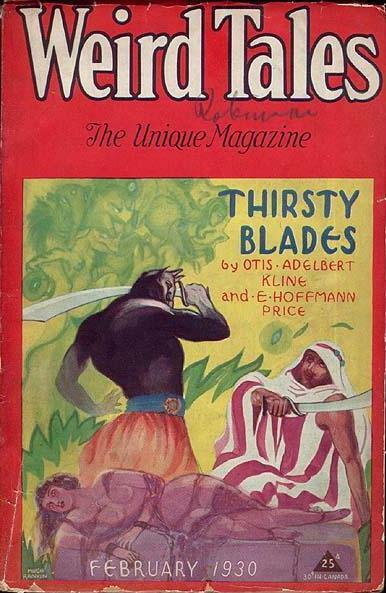 Collaboration between noted ERB impersonator, OAK, and E. Hoffman Price, one of the better pulp writers of the period. 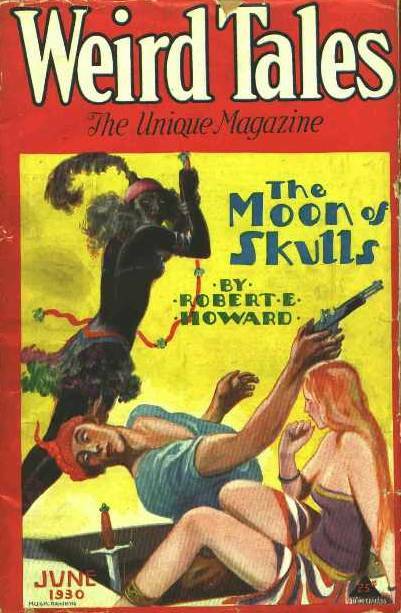 Early Howard story, but not his first cover (see last installment). A Solomon Kane story, though if that’s supposed to be Solomon, the artist, Hugh Rankin, missed a few details. ã€€Quinn, again. As an educated guess, I’d say that he had more WT covers than any other writer. A scarce Clark Ashton Smith cover. Strange, because he was an extremely vividly visual writer. Brundage and Quinn. Probably WT’s most prolific artist/author team-up. Noted ERB illustrator J. Allen St. John illustrates OAK, noted ERB imitator. Frog men! A third J. Allen St. John, illustrating New Mexico’s own Jack Williamson. Back to Brundage, to finish off the column. This is for the Quinn story, “The Hand of Glory,” though I don’t actually see one depicted. Brundage on her own this time, illustrating no particular story. I just wanted to prove that there really was a writer named Nictzin Dyalhis. We’re at the end of the column. But what’s that you say? We’ve only covered the first five years of the 1930s? 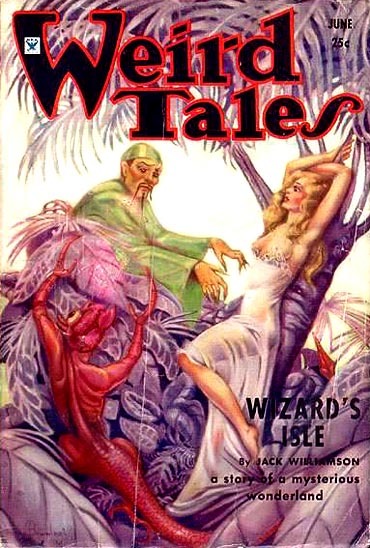 True, that, but I’ve decided that the Golden Age of WEIRD TALES deserves more than one column, so look forward to more great images from the 1930s next week!